The diamond community and much of the crypto world, has been impressed with the GLITZKOIN mission – to revolutionize the conservative and tradition bound diamond industry. Promoting the first diamond blockchain to be headed by an industry specialist, CEO Navneet Goenka has some clarifications to make. In his words, ‘… we are definitely not, recommending change for the sake of change. Having said that, there are some key areas where change is imperative if, the $90 billion industry is to reach anywhere closer to its true potential…’. There is no doubt that the diamond industry continues to operate in a conservative way, resistance to change is high. However that does not imply that, every aspect of the industry needs change or improvement. In an industry that provides employment to more than 10 million men and women across the globe, a few processes will always require human skills, patience and extreme artistry. Diamond cutting and polishing requires high skill and experience, it cannot be taught in a school and even the most talented engineers, would fail to grasp its finer nuances. The soon to be launched DiaEx Diamond Exchange, makes no attempt to encourage or recommend change in this very vital process. On the other hand, DiaEx has the potential to improve market scope and sentiment, something that would ultimately provide, more employment opportunities to these master craftsmen and artisans. So what are the major areas in the multibillion dollar industry that, DiaEx aims to revolutionize. The GLITZKOIN diamond blockchain project was conceptualized out of necessity, key features were included to improve efficiency and market potential in the industry. By allowing diamond buyers and sellers to directly utilize the advanced features of the diamond exchange, the DiaEx platform would eliminate the need for middlemen and brokers. The absence of brokerage fees and middlemen commissions, would unveil a more realistic price structure for the precious stone. This would obviously improve overall market sentiment. Limiting diamond listings to stones certified by a select group of reputed testing labs, would ensure that fake diamonds are not traded on the DiaEx diamond exchange. This would also remove the risk of sellers, overstating the 4C parameters for their diamonds. The GLITZKOIN diamond blockchain is designed to support both, B2B and B2C transactions. Both professional and debutant buyers and sellers can confidently trade on the platform. Diamond traders will no longer be bound by cumbersome, time consuming and expensive banking procedures. 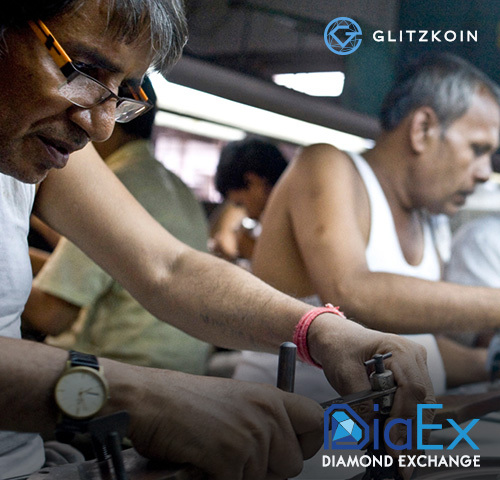 The GLITZKOIN GTN token will be used to settle payments on the DiaEx trading platform. The diamond community will be relieved to have this mode of payment. It would also alleviate the challenge of handling multiple currencies and coping with, complicated currency conversion logistics. The GLITZKOIN CEO adds that, ‘… and as we usher in positive change for the spectacular industry, the crypto world can continue their participation in the project by, trading the GTN token on the Stellarport exchange…’.